Obsidian paused, staring up at the door to the courtyard, the word jumping out at her. Made sense. And that was the frightening part--it all made sense. She was kind of nervous to walk through the doors and see the script etched on all of those gates. Sensory overload, a hint at what was through each one. For some reason though, the portal from home remained out of reach, blurred in her mind. She'd stared at the the thing so many times that it had been etched in her memory. Yet the image of the script remained cloudy now. She blamed Turmoil. Well, if it really came down to it, she only had herself to blame. Touching that portal scrambled a lot of things, including the recollection of her gate. And it wasn't as if she could simply go home and refresh her memory. No, she was stuck here until she found a way out. But when she thought of leaving, a crippling fear seized her. Not her fear--it couldn't be. The gate's fear. It didn't want her to leave. It didn't want her to fly away. Not until it sucked her in. "Obsidian?" Damian stood on the threshold, holding the doors open. "Something wrong?" "Just trying to figure out what the script over the door means." Kind of. Sid wanted to say it, wanted to say the word, to show off. Not only had she learned the Portal language quicker than he had, she also wanted to make him proud. The last was a bit of a puzzle even to her. "No. Not yet." Yesterday. She nodded and followed him to the library, making it a point to not look directly at the script on any of the other gates. Not only did she not want to be overwhelmed, she was afraid she'd give herself away if she openly gawked. They settled in the same study room as the previous days. "Did you bring the Portal language book with you?" Stupid. "No. I thought you'd want me to work on more precept memorization. Probably best to get that over with. Don't you think?" Did he buy that? He had to have bought that. Damian gave her one of his best examining gazes. "You were so eager to learn the language." "I think I just burned myself out a bit trying to make sense of it all last night. Stayed up way too late. A shift in focus is best, I think." "And if I'm being honest, it actually has me frustrated. It's much harder than I thought it would be. One of my roommates even mentioned that she's been studying it for almost three years and she's still lost. Kind of daunting." Yup, great job at digging the hole deeper. Damian sighed. "Daunting. All right. I'll get the precepts." Obsidian patted her brow with a sleeve of her robe after he left the room. She had felt like she'd been sweating profusely, but there was nothing there. All these years mastering lying, and this Guardian had her swerving all over. She handled it better under the stare of Councilwoman Liss. No matter now. She'd study the precepts all day, like a good little dedicant. Then tonight, before her roommates returned, she'd pry her book from its hiding place. Perhaps something inside of it would help her shake off the feeling she got every time she thought of Turmoil. The feeling that actually never fully left her. If Sid couldn't find a way to wash away the residue it left on her after touching it, maybe she'd find a way to open it, to give it exactly what it wanted. Damian paged through several texts. After delivering the precepts to Obsidian, he had begged off, claiming he couldn't decide what he wanted to read today. Well, he couldn't decide because what he wanted to read no longer existed. So he paced the shelves of histories, wishing he could find one further back, something from the time of the Ancients. More importantly, he couldn't sit in the same room with her for an extended period. The lies fell from her tongue as if they were water. He knew she was hiding something, he just didn't know what. And he didn't want to tip her off. He didn't need her looking over her shoulder, being more cautious of him, when he was trying to discover her secrets. Perhaps whatever she had been hiding had to do with that. But a more obvious answer settled in Damian's mind. She had unraveled the Portal language. An insane thought--no one could learn that quickly. And she knew that, the story about her roommate proof, so if she had puzzled it out, her instinct could be to hide her discovery. No. No way she could have learned it yet. The way she had stared at the door to the courtyard, though. He couldn't deny what he saw yesterday either. The script had instantly consumed her, and right at the end of her scrutiny, he saw a flicker, so close to comprehension. If he assumed she knew the language and was hiding the fact from him, there had to be a reason. She had been so eager to learn it. The only reason to learn it was to read it. Nothing interesting to read, not anymore. Damian slammed a book shut that he had opened but hadn't even glanced at the words. He was losing his mind, sending himself in circles. Obsidian was an enigma, and all she did was make him crazy. It could all be simpler than he made it out. He was seeing things. That was it. She hadn't lied to him--she had been forthright about being frustrated. In all likelihood, she had wanted to learn because of the histories that no longer existed. Once she discovered that, her desire was squashed. Damian tucked the book under his arm, not even looking at the title. Any book would do, as long as it got him out of his own head. He slipped into the study room, trying not to disturb her, and settled in the chair opposite. Then cracked the text open. "Why do you want to read about that?" He peeked over the book. Obsidian had her hand covering her mouth, clearly suppressing a giggle. Perhaps he should have looked at his reading choice before actually deciding. He glanced at the cover--A History of Fashion Throughout Nect. For the love of the Ancients. 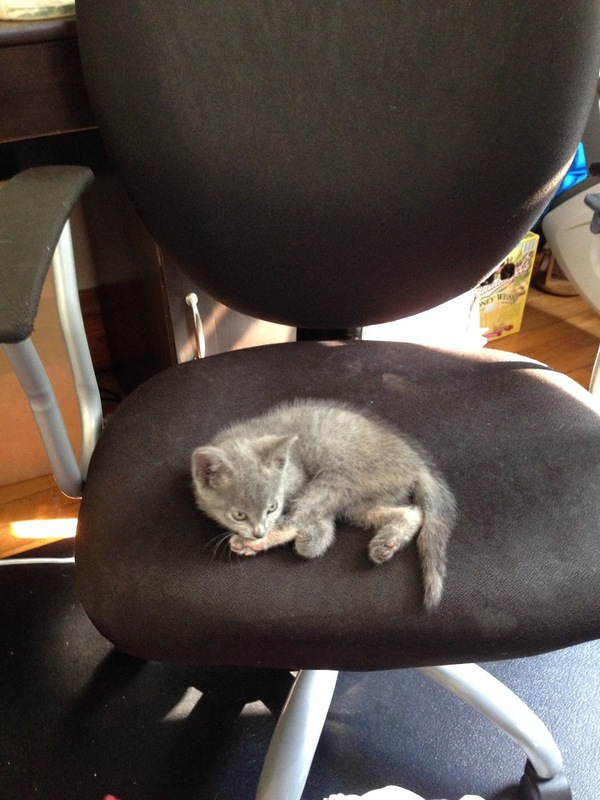 He shifted in his chair. "I've grown a bit bored with wearing the same thing day in and day out." So much for the truth in all things. Her hand fell away and laughter echoed in the small room. She pointed at the book. "Though I admit your plain white shirt and gray trousers could use some improvement, I don't think you'll get many good tips from that." Damian sighed and stared at the book. Certainly not. "Perhaps you're right." And suddenly, she was quiet. He shifted his focus to her, a small o of surprise on her face. "What?" Indeed, he was. It had been so long he'd had anything to smile about, he almost touched his face to make sure it was there. "Something wrong with that?" Obsidian shook her head. "You should do it more often." She tucked a stray hair behind her ear and beamed back. He should. No end to this girl's effects on him. First she addled his brain, and now she had him grinning bigger than he imagined he ever had before. And he felt lighter for it, less burdened by his duties as a Guardian. Damian had to remind himself, though, that he was a Guardian. Even if it meant he'd never smile again, it was his responsibility to uncover the secrets she surely harbored. He hated this corner he found himself trapped in. Picture By Tasnu Arakun Mabon! Most people know this day as the Fall or Autumn Equinox, and it is marked as the first day of Fall on most calendars (at least in the Northern hemisphere). The date this lands on can vary, but it's usually some time between September 20 through September 23 (it was the 23rd this year). It's the second day of the year where day and night is the same length. After Mabon passes, nights will start getting longer while the days get shorter. This is the second of the harvest festivals. It's also considered a Witch's Thanksgiving. This is usually the wonderful time of year where you start seeing apple cider popping up all over (yum, one of my favorites). So, the main crops of this harvest are nuts, apples, and grapes. Apple pie and wine? Who'd pass that up as part of a feast? I'm most familiar with the U.S. Thanksgiving, so when I think of Mabon, that's what I think of (just a couple months earlier). All those good foods associated with the harvest at this time of year are of course symbols. What do we get when we stuff all those foods together in a horn? A cornucopia, of course! You also have acorns, gourds, pumpkins, and sunflowers (my daughter's sunflower that she started from a seed finally bloomed on Mabon this year) that represent this sabbat. Of course I've only touched the tip of the iceberg. These websites might be a good place for you to start if you'd like to learn more about Mabon: Mabon, How to Celebrate Mabon, the Autumn Equinox, and Mabon - Overview by Christina. Madden, Kristin. Mabon: Celebrating the Autumn Equinox. St. Paul: Llewellyn Publications, 2002. Damian was amazed. More than amazed. 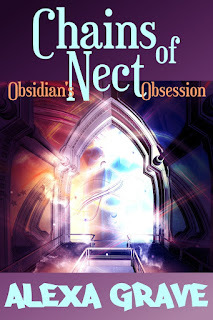 The script he had written and put under Obsidian's nose had sucked her in immediately, latched onto her so quickly that he almost sensed how the rest of the world fell away from her. Thankfully she remained entranced long enough for him to stabilize his own emotions. It wouldn't do for her to see how he truly felt about her instant latching onto the script. It took years for most dedicants to finally see the puzzle in all the strokes, if ever. He had learned exceptionally quickly, in a year's time. Damian was sure Obsidian would have it mastered in a matter of days. Days. How was that possible? It was as if she'd been exposed to the script before she ever saw it over the entrance to the House of Portals. It made him consider the metamorphosis he saw her undergo the first day more closely. This girl, no woman, had secrets, and now that he'd allowed things to go this far, he was intent on discovering those secrets. "I thought you were starving," Sid said. He had been pushing his salad around the plate, not eating much. It was her fault--had him all lost in his thoughts. But he also hated talking about opening gates. It always depressed him. "I was." She opened her mouth, then clamped it shut, and returned back to her own food. Smart. He really didn't want to chat. Obsidian had looked as deflated as he had felt when he was first told about all of the texts outlining how to open the gates had been destroyed. Along with many of the histories written by the Ancients. Not that he wanted to break the precepts and pass through a portal to see what was on the other side. Never that. But to know all of that knowledge was forever lost dug at him. Though he knew it shouldn't be done, knowing that the possibility no longer existed made him feel empty. It shattered the dreams he had as a child. His imagination had taken him to lands that were wild and beautiful because he thought there was a chance they existed. Now that he knew they couldn't, those colorful dreams turned gray. Yes, the worlds were still there on the other sides of the portals, but there was no chance that one would ever be seen. The Guardians insisted that a gate couldn't be opened from the other side. Their word was supported by the fact that, well, no one had opened one from the other side. At least not in the last two centuries, as far back as the histories went. Damian wished he could read further back, see what the Ancients wrote about the portals. All that knowledge lost. To protect Nect. Do not seek answers in the past. His least favorite precept. "Are you going to eat that, or should I go back to the library on my own?" Her plate was empty, not a crumb left. He seriously needed to get a handle on his wandering thoughts. "You may head back without me and continue to study the precepts. I'll join you shortly." He picked some greens up with his fork and shoved them in his mouth. His hunger still hadn't returned, but he had to eat something. The lettuce tasted like ash. Obsidian smiled. "See you soon." Damian watched her take care of her dishes and head out of the diningroom, the bun in her dark hair bobbing back and forth, threatening to come undone. Her hair looked better down anyhow. He shoved more salad in his mouth and forced himself to chew. Now, to give her some space, to make her think that he was allowing her to have some freedom. That's one of the reasons why he allowed her to stow the Portal language book in her room in the first place. Let her think he trusted her. Damian wanted to see how quickly she'd learn the language, though. And he'd watch her. Keep an eye on her. Especially if she wandered the courtyard at night. Then maybe he'd uncover her secrets. Sid's eyes felt melted after the afternoon of reading precepts. There were too many. No sane person should be expected to abide by so many rules. Even though she was exhausted, she sped through dinner and hurried to her room. She wanted as much time with the Portal language as possible. Before she passed out in a heap. So, she stripped off the horrid robe and made herself comfortable propped up in bed. It was hard with such a thin mattress, but she managed. Better than the torturous chairs in the library--she didn't go there because if she fell asleep while studying, she'd rather be in her own bed. Perhaps that was why the chairs were so uncomfortable. Got to keep dedicants awake somehow. Sid cracked open her book, and Ama entered the room. She had expected the place to herself for most of the night, since the other girls tended to be away late. "Not studying tonight?" Ama sat on the edge of her middle bed, facing Sid. "Nope. I need a break." She gasped and pointed to the Portal language book. "Is that...have you finished memorizing the precepts already?" Perhaps Sid should have been more careful--though Damian could be an emotionless jerk at times, she didn't want to get him in trouble. After all, he had given her some leeway. Too late now. "No. Damian is allowing me to study it while I work on the precepts." No need to mention that she blackmailed him. Ama sighed and flopped down on her bed. "That book. It's a thorn in my paw." She turned her head to Sid. "I've been studying it for almost three years, and I still can't comprehend it. The only words over the portals or in any of the other books in the library I know written in that script are the ones that I've been told." Three years. Sid couldn't imagine spending that long figuring it all out. Damian had mentioned that not everyone could unravel it. She hated to think Ama might be one of those people. If Ama failed to become a Guardian, Sid could only imagine what they would do to her. She knew too much--they surely wouldn't allow her to leave and pursue a life outside these walls. Ama's face scrunched up, and a tear traced down her cheek. "I'm not sure if I'll ever be able to understand it." It hurt to see such a sweet woman cry. "It'll come to you. Probably when you least expect it." She focused on the ceiling. "I only have another month to try. It better happen soon." As quickly as she had crumbled, she sat up with a smile on her face. "You know I heard Damian was the one who learned it the quickest of all the Guardians. It only took him a year. My mentor likes to brag about him, since she mentored him before me." Sid studied the cover of the book. A year. Could she be that patient? She had to be. No failing allowed. "Good luck with it," Ama said, while changing her clothes. "I think I'll crash early. My eyes need a rest." She crawled back into bed and rolled over. Sid squeezed the book. "You too." Ama had to do it. She would. The shadows in the room dimmed and Sid lit the oil lantern on her dresser, bringing it close, so she could study the strokes. Page after page, she swept her eyes across each slash and curl, at times tracing them with her fingers. At one point, Enid entered the room, but Sid barely registered her movements, so intent on the book before her. If it was going to take her at least a year to crack this, she'd have to concentrate on it as much as possible. Maybe she'd even have it figured out before she finished memorizing the precepts. The night wore on, and her lids started to droop. She pressed on, one page and then the next. Soon she hit the state between wake and sleep, that haze where if she took one more step she'd be softly snoring face down in the book. 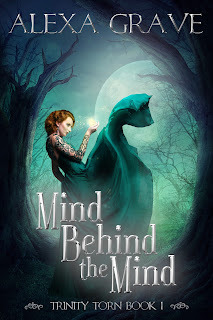 The rune above the gate popped in her mind, floating around among her blurred vision. Even the strokes of the ancient word seemed to reflect its definition. Sharp slashes, a swirl that you couldn't tell where the end or beginning of it was, ending in a horizontal slash, an X marked through, fluid but harsh at the same time. Staring at the word in her mind's eye, behind the fog of near sleep, she felt what she had earlier. The sense of the answer being just out of reach. One more push, one more connection, and she'd have it. Sid imagined her hand stretching out, tracing the final X of the script. Not slow, no. Fast. How it was written--force, speed, intent--was just as important as the specific strokes. A snap echoed through her mind, the puzzle pieced together in the palm of her hand. She sat up straight, having hunched over the book, thankful she had placed the lamp on the floor earlier. The haze of sleep vanished--now she was wide awake. And she knew, she had unraveled it. The answers to this ancient puzzle laid themselves bare in her mind. She closed the book and traced the words and phrases on the cover. Magic. Power. Learn. Knowledge. She saw them all, understood every single one. So much for a year. Try a day. Her heart pounded and her hands trembled. Sid looked at the sleeping Ama, feeling guilty over her discovery, even if it had been the one thing she had desperately sought to learn for the last six years. Perhaps she wouldn't tell Damian yet. Another thing best to keep to herself. Sid's stomach churned as she waited for Damian in the study room. She'd eaten too much for breakfast--the food was like a rock weighing her down. Or maybe it was just the excitement that she'd finally learn the letters inscribed on her gate. Damian slipped through the door, carrying two books. The one on the bottom was clearly the precepts. Too much to hope that he'd spare her the suffering of reading that thing two days in a row. But the one on top was smaller, and the entire cover and spine was filled with the ancient script. He placed both books on the table. She reached for the one on top. The book was under her hand, so tempting, so close. But his tone was stern, and she still needed to watch herself. She'd made too many mistakes already since she'd gotten here. Still now, she felt the yearning from the portal in the courtyard. "What is the first precept?" Sid swallowed, a nearly impossible feat since the rock seemed to have moved into her throat. He couldn't know--she was sure he hadn't seen her. "No one shall touch the gates without permission." A precept everyone in Nect knew since the time they could speak and understand. He shouldn't have needed to ask it. She looked up at him, hand still resting on the book, but she couldn't read his face. So even, so expressionless. Damned Guardian face. After allowing the seconds to stretch, he offered a curt nod and motioned to the book. "By all means. But it's back to precepts this afternoon." She snatched the book and opened it. That wouldn't be a problem--she'd have this memorized far before then. How hard was it to learn an alphabet? Damian settled across from her, not even hiding behind a book of his own this time, openly staring at her. Every part of her wanted to ask him what his problem was, to challenge his gawking, but she couldn't risk having him take this book away from her. No, not now, when she finally had it in her hands. She looked at the first page, and the stone shifted back down into her abdomen. It wasn't as easy as a letter in the Nectinian language matching up with a letter in the Portal language. Each combination of script represented a different sound, letter, meaning, full word. The complexity of it all astounded her. So, she poured over the pages, trying to make sense of it all. But for the little bit of understanding she thought she'd gained, she'd flip to another page and that knowledge would be shattered, uprooted by yet another layer. At this rate, she'd never find what was written above her gate. And even though the exact ruins were etched into her head as surely as they were on the portal, she couldn't ask Damian. Then he'd know about the gate, and not only would she be in trouble, so would her entire family. Sid looked up at him. Had he even blinked the whole time he sat watching her? "You knew this would happen. That's why you're just staring at me waiting." Almost, she thought she almost saw the corner of his mouth twitch. "Knew what?" Jerk. "That I wouldn't be able to understand any of this." Damian sighed. "It's a rather complicated language. It would be no good if any commoner could decipher it. So, the Portal Creators made sure it would take a lot of knowledge to read it. And to do so, a Guardian who already knows it needs to teach the dedicants. Even then, some dedicants aren't ever able to piece it together, to cohesively see the script and puzzle out what it says." He had been waiting for her to ask for his help. Sid hated asking for help. She glared at him. He crossed his arms and gave her his best statue stare in return. Really. He was really going to make her ask. She rolled her eyes. "Fine. I'm asking. Can you please help me?" If he thought choking out those words meant she was his puppy, he was wrong. Damian stood, opened the Book of Precepts, and slipped out some loose, blank papers he had tucked under the cover. Then he pulled out a fountain pen, a rarity Sid had only heard about, from a trouser pocket. Grabbing one of the sheets, he then wrote a bit of script in the upper left corner and turned it around so she could see it. "Do you recognize that?" "The word over the entrance." Here it was. Now she was going to find out it really did mean doom. Or House of Statues. "It may look like one word, but it's actually three. There are no actual spaces in the Portal language." He took the sheet back and wrote under the first line, separating it into three sections. "Each part of the phrase effects the part following it." He turned it back around and pointed to each separate bit. "There has to be a flow, a consistency. It has to do with the magic connected to the language. The power is in the strokes, since this is only a written language and not a spoken one. What do you think this means?" He tapped the first line, the whole phrase. Sid had already gone over the long list of guesses in her head since she had first sat on her trunk, waiting to pass under that arch. She didn't think Damian would want to hear her myriad of guesses, so she went with the one that made the most sense. "House of Portals." "Correct." He pushed the paper closer to her. "Now look at the script, look at how I have it separated, then again as it works together. Study it. And one day, if you have what it truly takes to become a Guardian, you'll see how it all fits, how it all flows together, and why this is the way House of Portals must be written." Sid did just that, stared at the script, at every stroke that made up the phrase. Perhaps what she had felt when she walked through the doors had been real. If the words themselves were written with magic in mind, it made sense that any arch labeled with them would give it some type power. A loop there, straight slashes there, more loops. Her eyes started to cross from focusing so hard. She knew, like with the precepts, this was something that normally took months or years to make sense of. But she was desperate, she had to learn it soon. The book hidden under her dresser insisted. And so did the gate from last night. At one point, she thought she almost had it, like the answer was just out of reach, and if she stretched just a little further, she'd have it. Then the sense of knowing shattered, and she had to pull herself away from staring at the script. Sid blinked, her eyes tired. She looked up to find Damian leaning back in his chair, paging through the Portal language book. When had he moved? She cleared her throat, and he peeked over the book. "Are you back in the world of spoken words?" His eyebrow shot up again. "Good timing. It's almost lunch, and I seem to be quite hungry. Guess I should have had more for breakfast." "Almost lunch?" Surely she hadn't been staring at the script for that long. Hours had zoomed by without her realizing. "You can clearly concentrate when you set your mind to it, Sid. Not many dedicants can focus that long at first. You may unravel the puzzle more quickly than any other has." He closed the book and pushed it across the table to her. "You may keep this in your room and study it on your own time if you wish." She picked it up, the key to deciphering what was in her own book gripped in her hands. "One more thing before lunch, though." He added a third line of script to the piece of paper. Sid gripped the book harder when she saw what it was. The word, or phrase, over the portal from last night. No. He couldn't know. If he did, she'd be at the mercy of the Council. "This is the word over that gate that almost ended your life last night." He tapped the page. "It means turmoil. Best to keep that in mind." Turmoil. She thought he meant for the word to scare her, to deter her from going anywhere near the portal. But all it did was evoke great sadness in her. If the people on the other side of the gate were in so much turmoil, someone should help them. Her sadness was contrasted by the desire to protect herself and her family. But not by keeping that portal closed. No. By opening it to discover just what kind of turmoil was on the other side, to be able to prepare for what might invade Nect. "Is that why the Guardians refuse to open the portals? Because so many of the words above them are so dismal?" She wondered if even asking this would get her in trouble. Perhaps if she asked another, but Damian had yet to trot her out to the Council for any of her actions. "Yes. There's no telling what threat lies beyond each gate." Sid was treading on thin ground. The urge to know, to have some answers, clawed at her, though. "Why would the Guardians do that? To have the knowledge to open the gates and never use it? Wouldn't it be better to open them and see what we'd be up against? Just in case someone opened a portal from the other side." She had asked herself these questions over and over again through the years. If the gates weren't meant to be opened, why did they even exist? The knowledge to open them existed as well, yet it lay collecting dust, unused and ignored. Damian pulled his chair up to the table and sat down, heavily. "We no longer know how to open the portals, even if we wanted to. The Guardians who started the precepts burned every copy of how to pass through, so as to remove all temptation. However, that is not something disseminated to the population of Nect." He delivered this response as if he'd heard from some historian, some teacher, one who insisted that he use the same exact words when he needed to answer the same question. The Guardians didn't know how to open the portals. Sid was suddenly aware of her blood pumping through her, reaching every corner of her body. Her head throbbed, her chest throbbed, even her eyes throbbed. And the book she found might be the last one that existed that told anyone how to do what no Guardian knew. Worse though, the responsibility of it all rested on her shoulders. Same word three times. 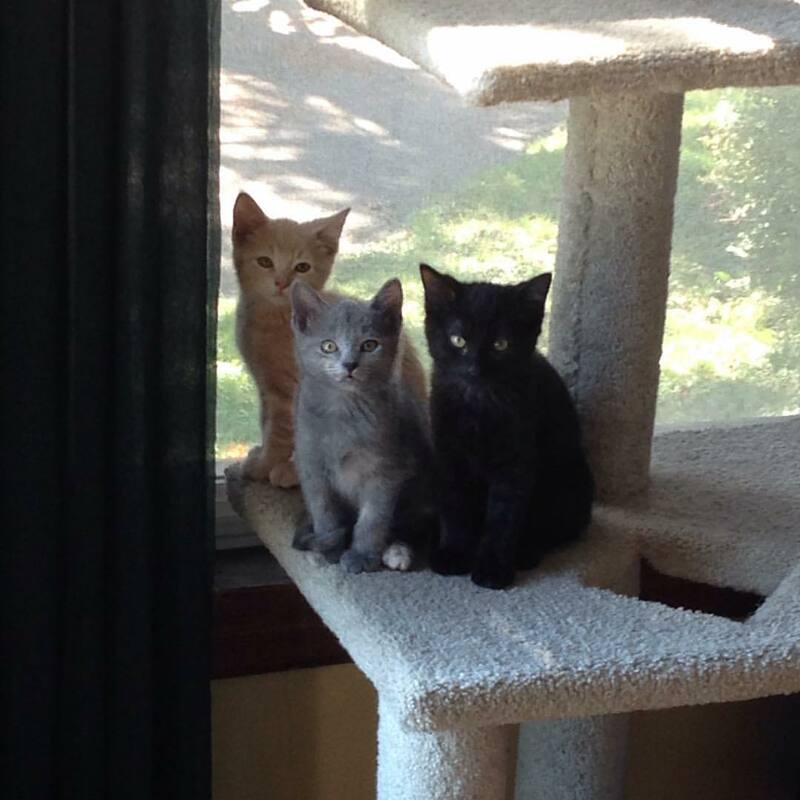 Kitten, kitten, kitten. Hm, what do you think that means? Could it be that we have some new friends in the house? Could it be that we have three new friends in the house? OK, OK. 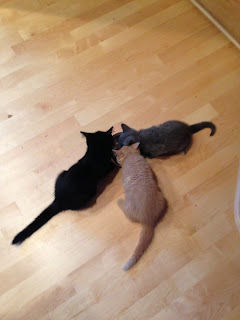 Yes, we have three new kittens! 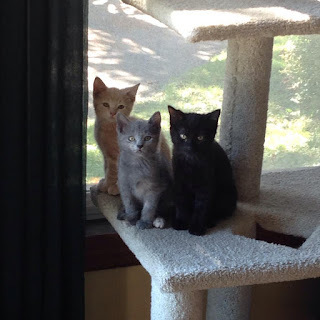 We intended to only get two, but when we went to the local Humane Society, there was this litter of four kittens. I wanted the black one, hands down. I also was attached to the buff one. However, my husband and daughter loved the little gray one. Our compromise was just to get all of the ones that we liked instead of making one of us sad. 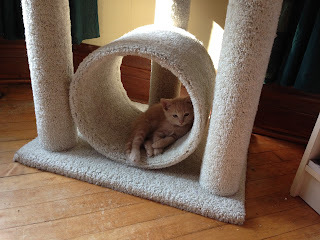 The people at the Humane Society assured us, the last kitten in the litter would be much easier to adopt out as a single kitty (there was just no way we could take four - three was pushing it!). Meet the Trio of Terror! Don't let this picture fool you. I am utterly amazed I was able to grab my phone quickly enough to snap a picture of all three of them together where they were all clearly visible. This awesome picture took two weeks of patience to get. They don't like to sit still, and when they're sleeping, they're rarely all in the same spot. First up we have Nightshade, Shade for short. I also call him Boo Kitty. Oh, and Binky Kitty, since he likes to play with the toddler's pacifier. As you can see, he's piled up the nicknames already. We should also call him Veggie Kitty. For some reason he loves veggies. He nabbed a piece of broccoli the second day we had them, and he growled at me when I tried to take it from him. No plate of food is safe on the table with him around. Then we have Rikku. 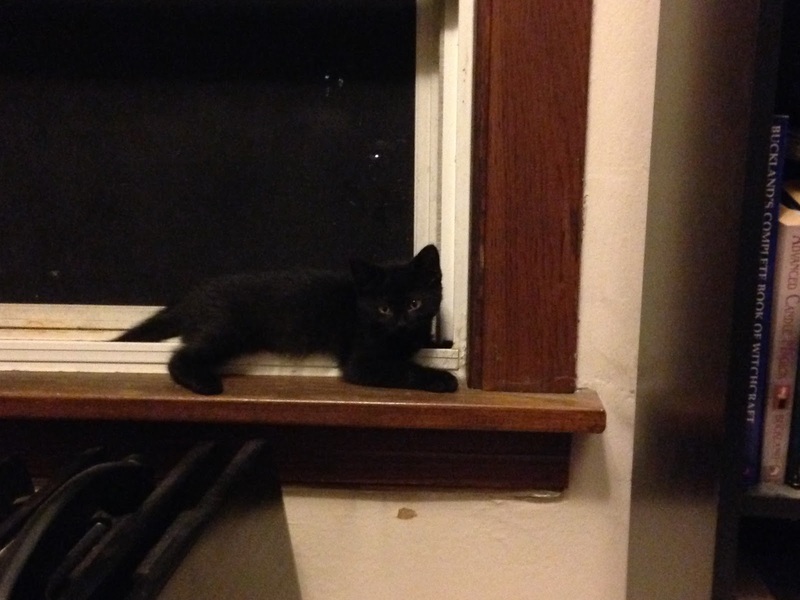 Yes, her name is from Final Fantasy X and X-2, and I've been warned she'll become a little thief because of it. 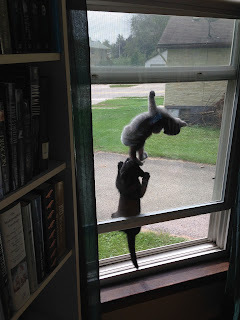 She's already a little rascal, of course, and she throws down with her brother spectacularly. She likes to suckle things, and her favorite spots to sleep are on soft things, especially our pillows behind our heads in bed when we're chilling upstairs. Her teeth are rather sharp, and she makes sure we're aware with her love and play bites. Finally, there's Sylph. Her name is a type of fairy as well as a summon from several Final Fantasy games. She is the peanut of the bunch. However, her energy is boundless. She doesn't let her size stop her from getting into everything with her siblings. And she loves plastic bags. If I hear one rustling somewhere, I know it's her playing with it, or trying to curl up to sleep on it. We also can't let her sleep on the pillows like Rikku because she will play with hair, and then there will be kitten claws and teeth all caught and tangled in your hair and you'll be screaming for someone to help you get her out! I may speak from experience. The hardest things with these little fluff balls is keeping the toddler in check. She's kind of a mean child. I'm waiting for the day the kittens teach her a lesson. Rikku's already scratched her twice, but she has yet to learn. One day. I hope. But I digress. Back to kitties. Not only are they so stinky that one poop in the litter pan can clear a whole level of the house. They're also little piggies. I guess that might explain the poop. They're also naughty as hell. Sid couldn't stop shaking, her hands grasping Damian's shirt so tightly that they hurt. First the reaction she had gotten from the gate, then the shock of Damian finding her, followed by him dragging her away. Finally the burst of magic that had rippled through the courtyard. Too much. All too much at once. She was lucky she was only trembling and not throwing up. After all that, she still heard the gate call to her, feeding its need into her. She lifted her head and looked back at the hill. It no longer stood in the same spot, though--it had moved closer. If she would have remained leaning against it, she would have been inside it. There went her stomach. She untangled herself from Damian and dropped to the ground, retching. At least there wasn't much in her, not having eaten a lot for dinner. Damian side-stepped, avoiding another portal right behind him. "It takes a while to get used to such a concentration of magic." She almost confessed to touching the gate, to prove that she could handle the wave of magic from the shift. But that would be stupid. And she'd been pretty stupid already. Understatement. If it hadn't been for Damian, she'd be dead. Sid still couldn't summon a thank you, though. He'd caught her out here, and she was sure after saving her life, the Council would just as quickly end it. Damian offered her a hand. She looked at it, uncertain she wanted more of his help. He had protected her, and only moments ago she had been wrapped in his arms, which oddly made her more hesitant to touch him now. Silly. She sighed and took the offered hand. A shock zapped her skin on contact. Damian jerked, obviously feeling it too, but instead of letting her go, he pulled her up. "Must be residual magic from the shift." He studied their joined hands, brows drawn together. "You've never experienced it before?" Now she didn't want to let go. Crazy emotions--touching that gate must have scrambled her insides. "This is the first time I've been around anyone during a shift." Damian met her eyes. It felt as if he examined her, tried to peel away her layers just with his gaze. "You shouldn't have been out here." Sid nodded. "I'm sorry. It won't happen again. I swear." "If you insist on walking around the courtyard at night, make sure to do it well before the shift. It's dangerous if you don't know where the gates move to." Did he just give her permission? Even if he didn't, it sure sounded like he wouldn't tell the Council. "You could always teach me the patterns." There went that eyebrow of his again. "Just in case. Who knows, maybe one day I'll have to save another dedicant." Weak excuse. "Am I in trouble?" "I think you've learned your lesson on this one." If he only knew. Not only had she learned to avoid the shift to keep her body intact, but touching gates in this courtyard should be avoided. The magic here was stronger than from her gate back home. She should have known better. But ever since she got here, she hadn't been careful enough. The anxiety still throbbed through her and she didn't think it would fade any time soon. Not until she opened the portal. "Definitely," she said. "Definitely learned my lesson." "Then you better head to bed before your roommates notice you missing." "Of course." Sid wobbled across the courtyard on legs of jelly. Good thing the size of the area had shrunk with this last shift. It was going to be hard enough trudging up the stairs. She looked back, thinking Damian would be right behind her, but instead of on her heels, he remained in the spot he had dragged her. He stared at the hill, a lost look in his eyes. At first, she thought of calling out to him, but something on his face made her think twice. And she didn't want to stir the pot anymore than she had already tonight. Sid turned away, leaving Damian to his reflection, and wove her way back to her bed. After the shock Damian received from Obsidian, a need so powerful, that he had to carefully choose his words, swept through him. It felt like when he had touched the gate for the first time. He looked wistfully at the hill once she departed, just glimpsing a sliver of the gate through the crevice. Yes. Come to me. The words whispered in his head, so soft that they could be mistaken for the wind, but there was no breeze right now. The night was still. He looked at his fingers, moving them about, trying to shake off the numbness that still covered the tips. The need to go to the gate was strong, even stronger than when he was a child. An ache settled in his chest, one that made him feel a sense of loss--an ache that didn't feel like his own. Beyond a doubt, Damian knew Obsidian had touched that portal. He should run to the Council, tell them, let them know she had broken the first precept. Yes, that's what he should do as a Guardian. Make sure she was tossed out of the House of Portals before she caused any real damage. But like in the council room, he remained rooted, mute. Perhaps his will wasn't as strong as he thought it was, and the gate itself directed his actions, his mistake from over a decade ago still haunting him, still making an impression on him. 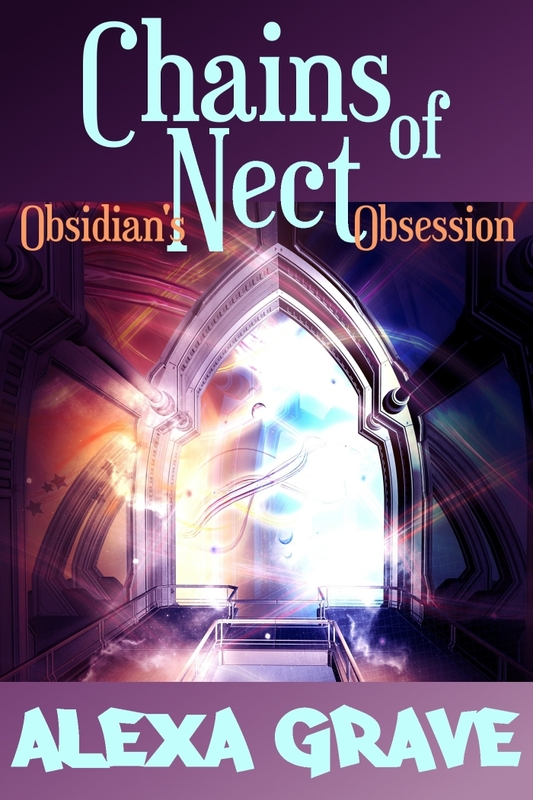 The sensation from touching it had taken weeks to wear off, but maybe it never did, maybe it remained buried, hidden, and now that Obsidian was here, it reared its intentions and bent his decisions to its desires. That was a hefty theory. The magic couldn't be that strong, could it? He told himself he had no proof. No reason to accuse Obsidian of doing something that he didn't actually witness himself, no matter how sure he was that she'd done it. Again, he felt he was trying to justify something he ought not. Gradually, he realized exactly what he had told her before she headed back to her room. He'd told her she could come into the courtyard at night. Not the best idea--he was doing a rotten job as a mentor. But why shouldn't she be able to do something that he'd done practically all his life? Because she had touched the gate. Damian's mind battled, wanting to hold the precepts up on one end, but not able to come to terms for punishing her for a mistake that he himself made on the other. He sighed. The former side won, for now. Not like the Council would find out since there were no witnesses. He forced his feet to move, tore his gaze away from the hill, and made his way back inside. Dawn would come soon, and the halls and courtyard would be full of Guardians and dedicants hustling to get to their studies or jobs. Best he not be standing here when that happened. Instead of going to his room, though, he went to the dining hall. He found an apple and sat down in the currently deserted room to think. He needed to do something, even if it wasn't reporting Obsidian to the Council. And he couldn't accuse her to her face either. But how could he temper her desire, teach her that the precepts were in place for a reason? The ache that still throbbed in his chest reminded him all too clearly why the first one should be followed. When he had touched the gate as a child, he knew nothing about it. True, he still didn't know what the world on the other side was like, as all the books relating to the worlds had been destroyed a long time ago--a way to protect everyone in Nect. But he now knew the word at the top. His stomach dropped just thinking of the word. There was nothing good on the other side of that gate, no matter how much it begged to be opened. Not like he could even if he wanted to, anyhow. Knowing what was etched on top of the gate, that solidified his belief even more that the precepts were in place to protect everyone, common person and Guardian alike. Not all the portals had such dismal labels, but there was no reason to risk it just because something sounded nice. Perhaps if she learned the script, then she'd think twice, reconsider stepping out of line again. Of course, that meant he'd be giving her exactly what she wanted. He wasn't sure how wise it was to do so because she must have a reason to have asked for it, and not just due to boredom with memorization. Smells drifted from the adjacent kitchen--dedicants were hard at work preparing breakfast. And soon, people began filtering into the dining hall. Most didn't spare Damian a second glance, him sitting there with a mostly brown apple in his hand and watching everyone pass. Eventually, Obsidian entered, grabbed a full plate of food, and joined him. "You know, you might want to throw that out." She wrinkled her nose. "How long have you been sitting here?" "Long enough." No amount of time was long enough to figure out this problem. Though if he continued to bounce back and forth instead of actually making a decision, his inaction would have its own repercussions. "Well, you may want to grab something else to eat. I'm starving after last night." At least she didn't openly mention experiencing the shift in the courtyard where any number of ears could hear. She wouldn't have even stepped into the House of Portals, though, if she didn't have a decent head on her shoulders. Damian placed the sad apple on the corner of her tray. "I'm not all that hungry." Food couldn't take away that ache. "Your stomach." She shoveled the food in like she hadn't eaten for days. In actuality, he guessed she hadn't had much the last couple days. It took magic and near death to stimulate her appetite it seemed. He leaned toward her. It wasn't against the rules to say what he was about to say, but he still didn't like the idea of others knowing he was going to veer off the beaten path. "Today, you can start learning the script." Obsidian stopped chewing and stared at him, then a grin split across her face. She quickly covered her mouth so her food wouldn't tumble out. At least one of them was happy with his decision. Obsidian threw her covers off and sat up in bed. Neither Enid or Ama stirred--perfect. She had been too exhausted the night before, but tonight she intended to take a look at the gates up close and personal. It had been a long, boring day trying to wade through all of the precepts. The only highlight had been rattling Damian. She actually felt a little bad for taunting him with the name, though--she wouldn't do it again. And she only did it then to have some opening to start studying the script. Still, it made her feel oily inside. Sid quickly slipped on some breeches and a dark shirt. If she wore the dedicant robes, she'd stand out like a cat in a hen house with the white. Then she slipped out the door, after looking to see that the coast was clear. The gas lamps in the halls were still lit, so at least she was able to see where she was going. She stayed close to the inner wall, just in case she had to duck into a doorway and hide from any Guardians who were up this late. She didn't see anyone until she reached the first level. A couple dedicants with loads of laundry passed by while she hid in the shadows of the stairs. She hoped she didn't get that job--laundry was the worst. And getting up this early to clean everyday would be torture. After they passed, she wrestled with keeping the large door to the courtyard quiet, which proved difficult. But when she stepped out under the stars, the waxing moon only a few days from full, the struggle with the door had been all worth it. For once, she embraced the silence and inhaled the magic that permeated this place. The moon shone down on the portals, making it look like they were glowing. The words at the top of each gate shone the most, glimmering in the evening light, begging to be spoken. She would if she could. Sid wove around the portals, looking closely at each one, getting a sense of their differences. Just like the foliage on the stained glass in the foyer of the House of Portals, each gate had its own quirks. She felt the subtle differences in their vibrations. No portal led to the same world as another. Oh, and there were so many worlds. She wanted to visit every one of them. Eventually, she came across a twisted hill, so misshapen that she wondered how nature ever could form such a thing. It stretched to the height of the base of the third floor. She circled around it and found a crevice big enough for her to step through. And inside hid a gate, cocooned by the weirdly shaped hill--clearly it had been magic and not nature that had deformed it. An opening, which she hadn't been able to see from the outside, allowed the moonlight to filter in. This portal shimmered stronger than the others, and a wave of serenity washed over her the closer she stepped to it. Sure that no eyes were upon her, she reached for the script at the pinnacle and traced it, like she had with her gate back home. The comforting feeling grew stronger, throbbing in her fingertips, moving up her arm, and soaking into her chest. She'd never gotten this strong of a reaction from the other portal. It seemed like this one was desperately trying to convince her it was safe, safe to open it and explore the world inside. A note of pleading lay under the one of calm. Sid yanked her hand back, unsure if she had truly heard the words in her head. Disengaging from the gate dulled the feeling of peace, but she still felt the call of urgency growing stronger. Did the portals have emotions and thoughts? Or was someone within the world on the other side calling for help? The words in her head had been too soft, too quiet to derive anything from them. The need of whatever or whoever spoke to her clawed at her chest, making her anxious. She left the little alcove, hoping for a reprieve, but the feeling wouldn't pass. It leveled out, at least, no longer growing--if it had grown much more it would have burst her at the seams. She leaned on the twisted hill, taking deep breaths and trying to harness the yearning she felt. A surety sunk into her bones that the only way she'd shake this was to open the gate, to do as asked, to aid whoever needed it. Sid peered into the crevice and resolved that she had to turn that maybe Damian had offered her into a yes. And soon. Just talking about the forays into the courtyard at night drove Damian to do just that. He wanted to watch a shift, to feel the magic flow through him. Perhaps it would settle him down after dealing with Obsidian. And it might even give him some insight into her, or at least help him decide whether he should allow her to learn the portal language sooner. So, he wandered around the gates, sensing the shift was near. He almost hadn't made it in time--Obsidian also had a knack for exhausting him. The stars twinkled above, his companions to watch the magic unfold. But he had to find a spot to observe from soon, or he'd risk being injured. Damian found himself still moving around the portals, though. An itch tickled his throat. He knew what it was, and he let it be, allowed the draw to pull him. The one gate he'd touched, at times it sung to him to return to the scene of his crime, to look at it again. It always pleaded to be touched, but he wouldn't make that mistake twice. His will was stronger now, and as a Guardian, he wouldn't break the first precept. Ever. No one shall touch the gates without permission. He didn't have permission. Almost no one did or ever would. He crested a rise and saw the hill he sought. The magic vibrated in the air. Close now--he'd have to hurry. Damian circled the misshapen hill, wanting to at least get a glance at the gate hidden inside, not only to listen to its hum, but to also remind himself of his mistake, one he intended to never make again. The precepts existed for a reason. Instead of just finding the entrance, though, he turned the corner and almost ran into Obsidian. She leaned against the hill as if out of breath. She couldn't have touched the gate, could she? No, if she had, she'd still be in there most likely. Tricky gate. Strong gate, especially so close to the shift. "Sid. What are you doing here?" She jumped and spun around. "I . . . ."
Wow, at a loss for words. He didn't think that could happen to her. "I wanted to see what it was like out here at night. You made me curious." She straightened, but still had a hand on the hill--she looked unsteady. Perhaps the impending build up of magic had her shook up. Yes, he felt the shift building. Any moment now. "Come with me." "I'm sorry. Please don't take me to the Council." She thought she was in trouble--well she would be if she didn't move, and not the trouble she was thinking of. If she stayed where she was, she'd become embedded in that hill. The power around them shot up, and she glanced all around her. "What's happening?" Too late to make her move. He should run and leave her to her fate. "The shift." Damian wrapped his arms around her and pulled her away from the hill, risking the chance that he might join her within it, hoping the magic would hold off a few more moments. Damian squeezed tighter, thankful he was stronger than her, and yanked her away as far as he could. He had to gain enough distance and make sure he didn't pull them into a spot where another portal would move. A loud crack snapped throughout the courtyard. Obsidian stopped fighting him and clung to him instead, burying her face in his chest. No point in pulling her along anymore--where they were was where they'd meet whatever end the gates wanted them to. He hugged her close and squeezed his eyes shut, not wanting to see what was coming, not this time. The magic cascaded over him, like always, making his heart thunder faster than it ought to, the power ripping through his body. It consumed him, but also made him more distinctly aware of Obsidian in his arms. She gasped, the magic assaulting her as well. Slowly, the wave subsided and the power drained from the courtyard, retreating to the gates. Damian opened his eyes and looked around, still holding Obsidian close. The end of an arch was right next to his left leg. If he had taken one more step back, he would have lost his foot. Thankfully both of them were still whole. Obsidian trembled, head still tucked in. He held her, waiting for her to calm down, refusing to let go until she did.